You will be asked to log in using your LDAP credentials, via Princeton’s central authentication system (CAS). 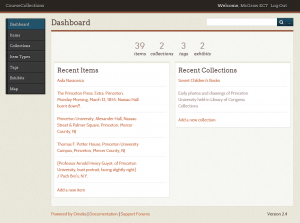 Collections are the core of Omeka. They can hold any number of items, just as long as each upload is less than 2 MB. Once you are logged into Omeka, there are two possible views. Click on the “Omeka Admin” menu item to get to a control panel called “Dashboard.” This is where you can upload files to Omeka and interact with the controls for Omeka. 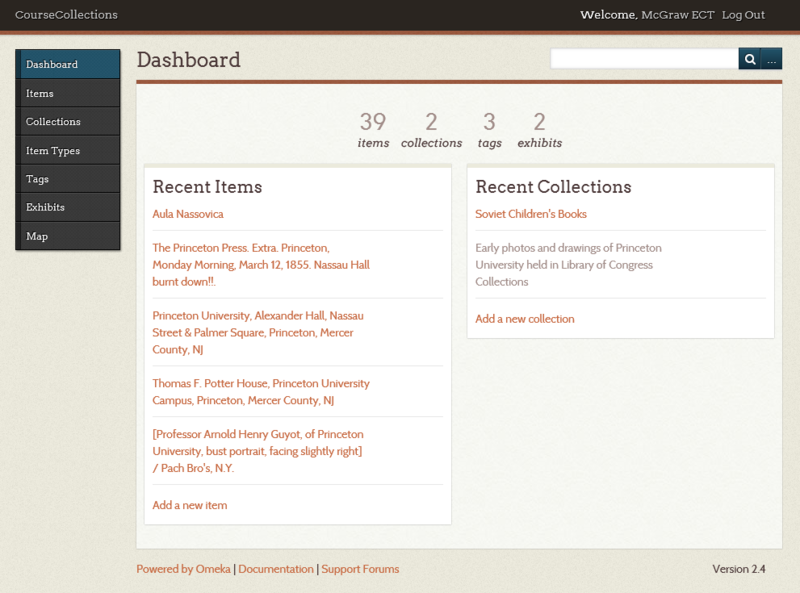 From the Dashboard, you can add items, add a collection, or create an exhibit. Items selected for an exhibit need to already be uploaded to Omeka as an item or a collection. To start a new collection, select the “Collections” option from the left menu, and name your collection to suit your topic. Collections can be public or private. You, only, will be able to see “private” items collections, exhibits; no other users can see them. When adding items to Omeka, you will first be presented with a screen to enter metadata You don’t have to fill out every field. Do the best you can. Always include a title and description. Once you fill in the data sheet as best you can, you can select a collection (or not) to which you want to add the item. To attach an image to the record you just made, select “File” from the top of the screen, and select a file to upload. The upload maximum size is 2 MB. You can add several files to the same record. Items added to the Omeka system are organized by using tags and collections. Each item can be marked with an unlimited number of tags. A tag is then used to generate pages on the website listing all the items marked with the tag. Collections are logical grouping of items and are the primary way that content is displayed for the visitor. 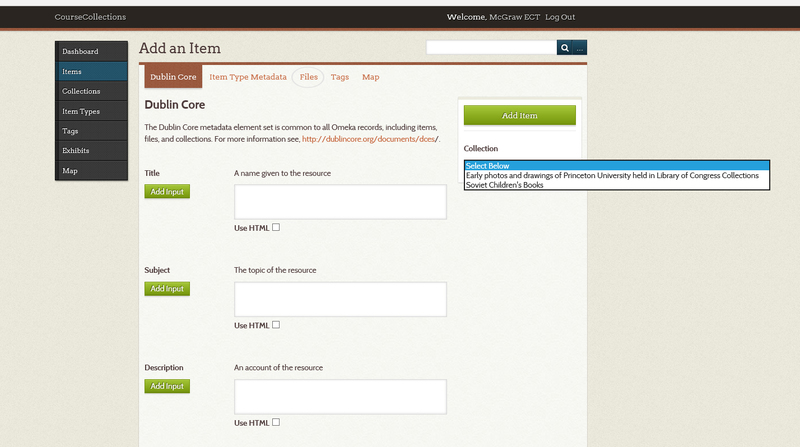 Collections exist within a shared space in Omeka and any item can be added to one collection. At any time, you may return to administrative interface, or Dashboard, to edit metadata or add more media files to an item. To do this, select the items menu item on the left-hand side of the Dashboard, find the item you wish to edit from the resulting list, and clck ‘Edit’. Notice also that there is a link to delete the item. Clicking this link allow you to reomve all metadata and associated media files for that item from the system. Exhibits can be created from already-uploaded files or items in collections. While building an exhibit, there is no way to add a new item. You have to return the the Dashboard to add an item, or add something to an existing collection. Please return to the drop-down Omeka FAQ at the top of the page to see the help section for creating an Exhibit.